When I was growing up, the ultimate LEGO set for me was a pirate ship. It was the coolest, biggest and most exciting set, and there were a few to choose from! Every birthday and Christmas, I would shake the gift, and if I heard that distinctive rattle, I knew it was LEGO. My next wish was then “Please let this be a pirate ship!”. Obviously the size of the box gave it away, but every time I was a little dissappointed that it wasn’t a ship. Many years of adulting later, and that wish still held true, until last year, when it was fulfilled! I couldn’t believe it. It took me until I was into my 30s, but last year, I sat in bed, opening my birthday presents, and there was a big box with the beautiful rattling sound. I quickly opened it up to have The Brick Bounty staring back at me. I was ridiculously excited! Finally, a ship of my own! I was ecstatic. After a few months of busyness, I was able to sit down and build it with my wife. We thoroughly enjoyed the build process – read on to find out what we thought. 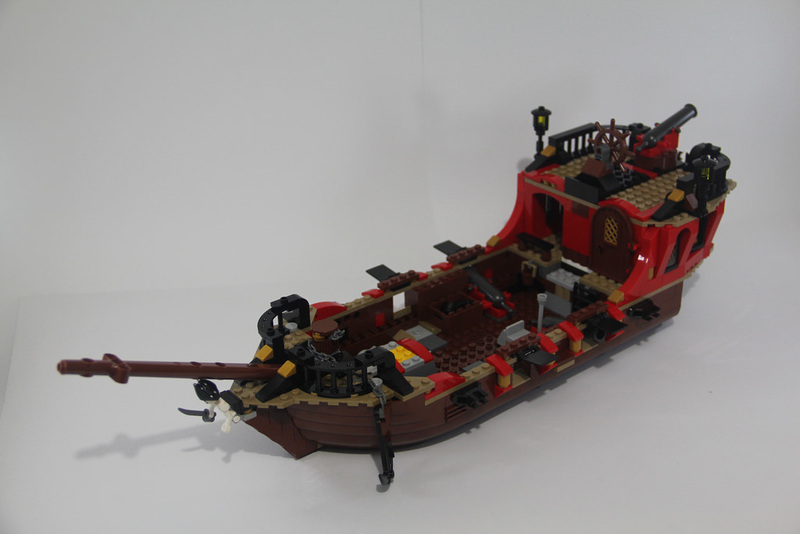 There’s some obvious similarities to 6243: Brickbeard’s Bounty, and I’ll explore that more in the Design section. 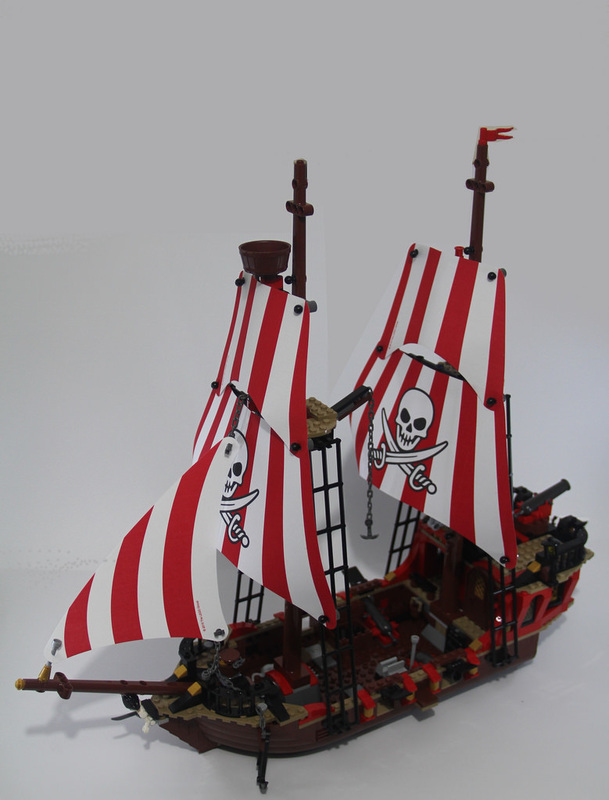 There’s been a fair few pirate ships over the years – this is the 15th pirate ship that LEGO has released since 1989. They range from the tiny 6250: Cross Bone Clipper at 154 pieces, to the mother of all ships, 10210: Imperial Flagship at a whopping 1664 pieces. It’s crazy, but my new goal is to collect them all. 1 down, 14 to go! This is going to cost me a lot of cash. 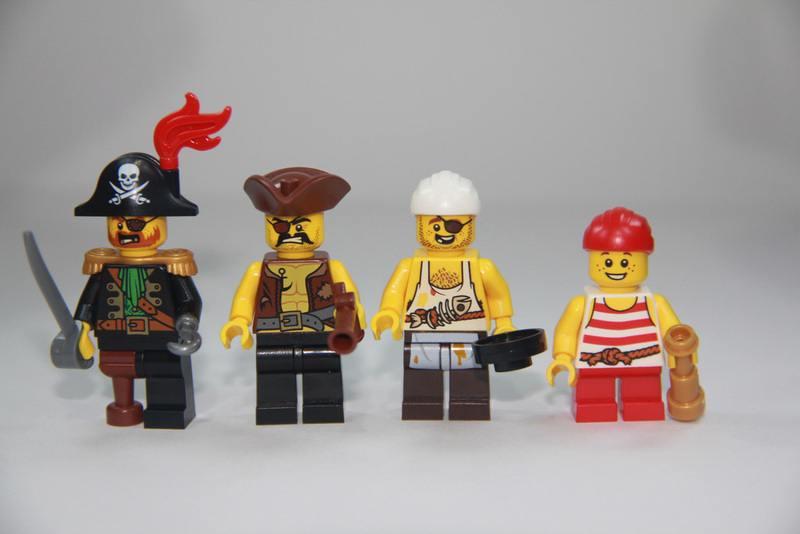 Let’s take a look at the minifigures first. 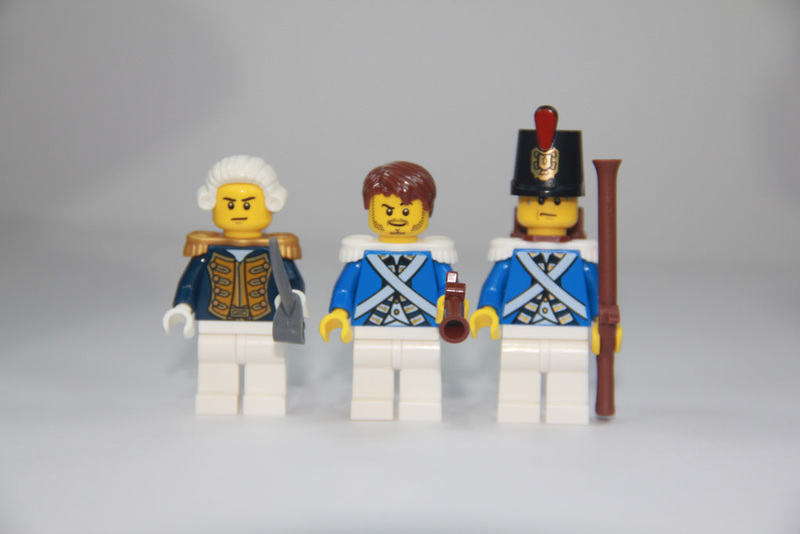 You’ll get seven, four pirates (one of them being Redbeard, the possible reincarnation of Brickbeard), and three bluecoats, one of which is an Admiral. 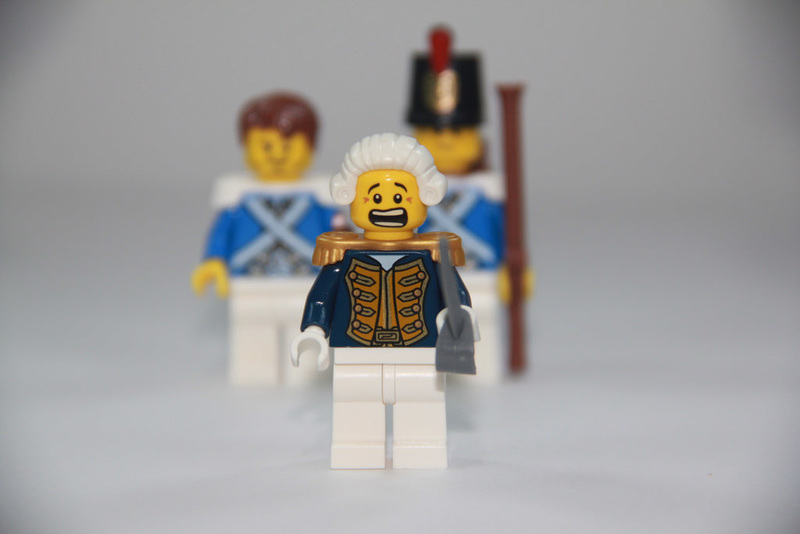 The bluecoats include two pretty standard ones, and a fantastic looking Admiral. I was really excited about this one, as I didn’t have a high ranking Bluecoat apart from the generals and governor. The Admiral looks great in his fancy coat and wig. He’s also got a double sided face, with a determined look, and a frightened look. I thought this was a great inclusion! 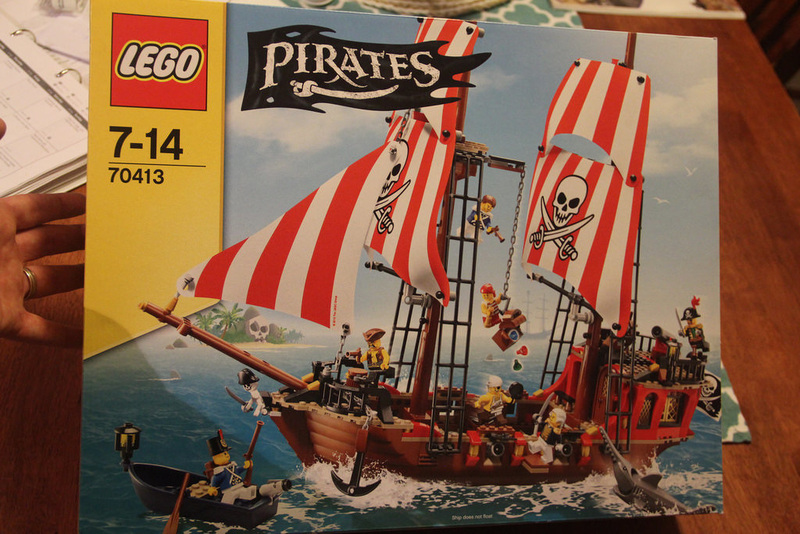 There is a plethora of new parts included in this set, including Redbeard’s hat and torso, the chef’s head and torso, the stern, hull pieces and masts that got a slight redesign, the Admiral’s wig, four sand yellow half circle plates with cut, the fantastic big pirate flag, and the sails – that came in a separate flat packet so they would not get crinkled or curled, thanks LEGO! 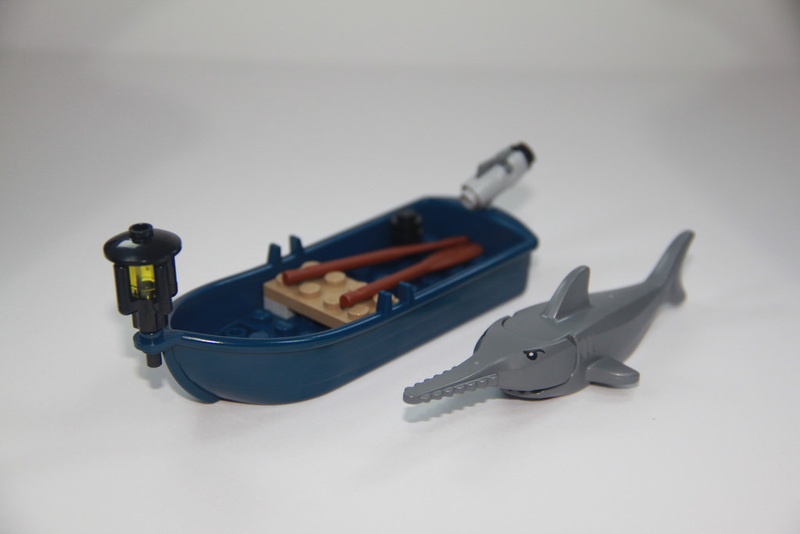 Other hard to find elements include the blue boat I mentioned last week, the sawfish head, the other pirate torsos, lattice that is used as rigging, arches, bricks with bows, and plenty more. There’s a lot in this set that is brilliant. If I kept going, you would need to set 24 hours aside to read it! This set is absolutely, and inherently swooshy. It’s a pirate ship! It’s meant to be sailed across the carpet, having battles with the bluecoats, cannons firing, bluecoats boarding, then quickly being forced to walk the plank, because let’s face it – in this theme, the pirates are the side we all back! There’s even some play functions in the cabin. 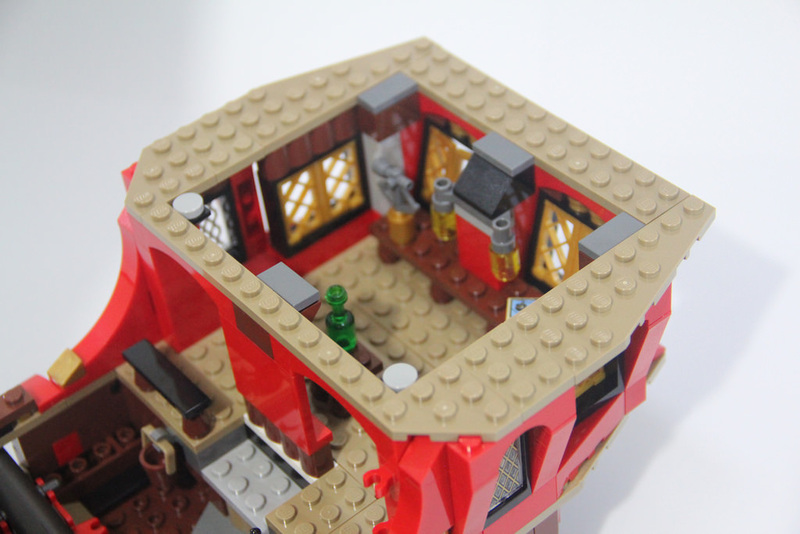 There’s room to move around, and a cool little hidden compartment underneath the table that houses some secret treasure. It would have been great to have a few more pirates, to really man the ship, but that’s where the other sets can come in, if you have them. The build process is pretty simple, with a basic build up process. There’s not too much fancy techniques, but has some nice little surprises scattered through. I would have preferred to see the cannons on wheels instead of stuck to the deck, but I did like the addition of the foredeck, and the way the plank was added was very neat, and quite secure. It’s exciting when the masts and sails are added, as it gives the huge height to the set, and with the sails, becomes quite an imposing build. I also like the way the sails are held on. It’s neat and secure, unlike other methods I’ve seen before, especially in Brickbeard’s Bounty. It’s an excellent build experience – one that kids and adults alike will get a lot of enjoyment from. There are a few little downsides however. While the ship has enough ports for five cannons – two each side and one at the back, only three cannons are included. It’s a real shame to have two empty ports, but that’s ok. As well as that, the port hole flaps can’t be shut flush with the ship’s hull, as the cannons are secured in place. Another small thing, and something that’s quite common in striped sails, is that they’re not reversible. It’s fine for the main masts, but for the jib (the front triangular one), it’s only striped on one side. Essentially, you can only display it from the left side. It’s not a major problem, and to be honest I only noticed it when I was planning my Pirates display layout. I had to rotate the ship more to make it look better. Others that I noticed is that the rigging doesn’t go all the way to the top, so the cabin boy has to climb up the mast to get to the crow’s nest. I thought that the bowsprit (the mast that connects to the bottom of the jib – yep, I’m learning nautical terms at the same time!) was a little too far back. 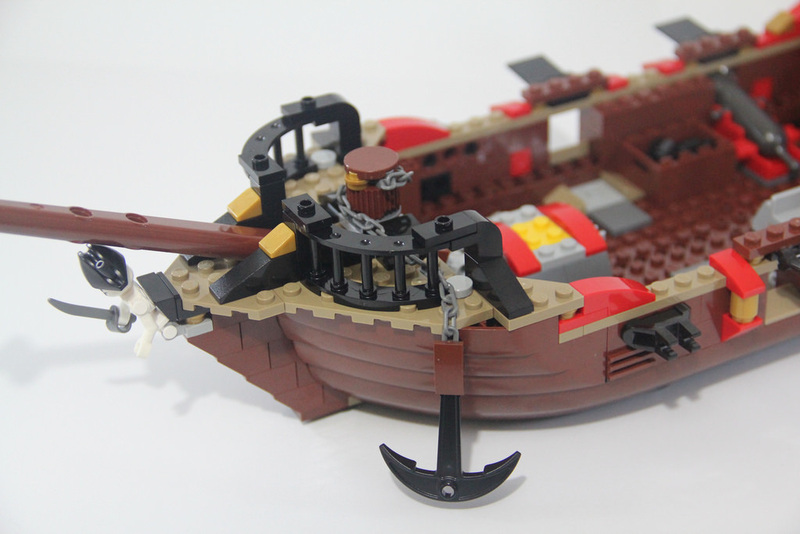 I was hoping that this was going to be further forward to lengthen the overall ship, like it is in Brickbeard’s Bounty. Aside from those very minor nitpicky things, it’s a great model. You will be forking out around $190 for a new set, and $150 for a used with this one, but it’s definitely worth it. There is some great inclusions in this set, so the value for money in this set is good. Well worth getting a copy! Unfortunately it’s a retired set from LEGO now, so secondary markets are the only option. 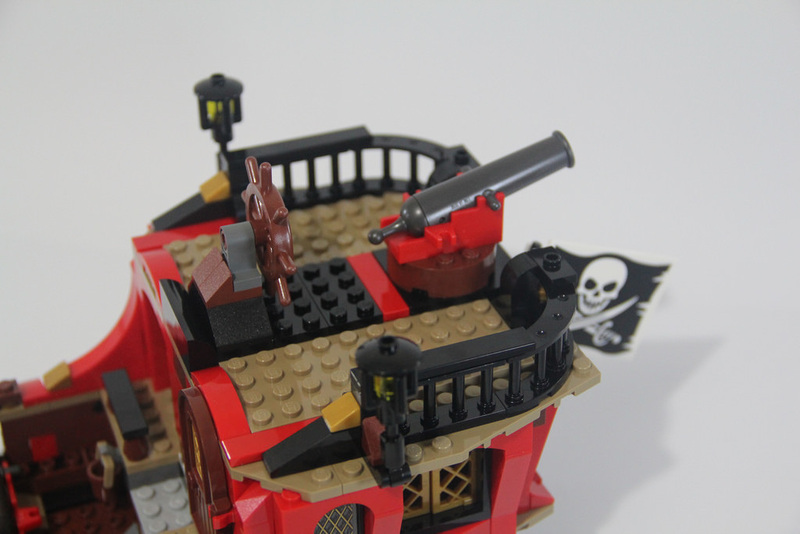 Pirate ships are highly collectible, and we haven’t seen one for a few years, so this will be a highly sought after set. There are loads of Pirates fans of all ages, and whether you have a bunch of other ships already, or this is the first one you have for your fleet, you’ll want to get in quick. Leave it too long, and the price will most likely go up. There’s one last set from the Pirates 2015 range that I’m yet to review, but I haven’t built it yet – 40158: Pirates Chess Set. I’ll get there, but next week, I’ll be looking at 10220: Volkswagen T1 Camper Van. This is an absolute cracker! Until then, happy building!